A cybersecurity firm found critical vulnerabilities in a messaging application used by White House staffers, which could have allowed malicious hackers access to their conversations. IOActive released a report Wednesday that found critical vulnerabilities in the messaging application Confide, which were fixed on March 2. IOActive began conducting its investigation into Confide’s vulnerabilities in February and found that hackers could impersonate another user by hijacking an account session or guessing passwords, learn the contact information of all or specific Confide users, become an intermediary in a conversation and decrypt messages, and alter the contents of messages and attachments. Not all Confide users will be able to know if their conversations have been monitored or altered by hackers. “We’re not aware of any reliable method to detect all disclosed attacks,” said Ryan O’Horo, senior security consultant for IOActive and co-author of the report. MeriTalk previously reported that White House employees close to President Donald Trump have been using Confide to prevent the type of email hacking and release of information that occurred at the Democratic National Committee. 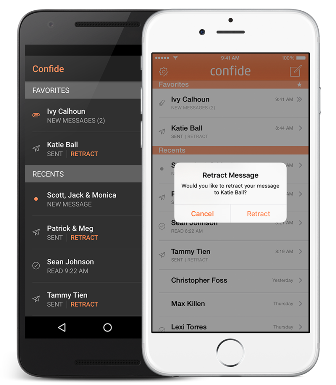 Confide encrypts messages from end to end, allowing only the sender and receiver to read them. Once the message is read, it disappears. IOActive found that the application’s notification system didn’t require a valid Secure Sockets Layer (SSL) server certificate to communicate, which would leak session information to hackers attempting a “man-in-the-middle attack.” An SSL is the technology that creates an encrypted link between a Web server and a browser. This link ensures that the data passed between the server and browser remains private. The attacker can get into Confide’s network using a stolen authentication token and access the target user’s messages “far into the future, from any location,” O’Horo said. Confide boasts “military grade end-to-end encryption,” which specific industries can take advantage of to keep their communications private. However, White House staffers must abide by the Presidential Records Act, which requires all presidential business to be documented and archived. Brod said that Confide expects users to abide by any records management laws that pertain to their industry. IOActive found that users could send unencrypted messages and that the app didn’t notify users when unencrypted messages were received. The security firm also found that Confide didn’t use authenticated encryption, which would allow messages to be altered in-transit. Attackers also had the ability to send malware through messages. Confide failed to prevent attacks on user account passwords and users were able to select short, easy-to-guess passwords. Confide released an updated version of Windows on March 2, which fixed the problems that IOActive found in its report.